Nominated by John Adams on February 18, 1801, to a new seat authorized by 2 Stat. 89. Confirmed by the Senate on February 20, 1801, and received commission on February 20, 1801. Service terminated on July 1, 1802, due to abolition of the court. Dilger, Robert Jay. "Oliver Wolcott Jr.: Conspirator or Public Servant?" Connecticut Historical Society Bulletin 46 (July 1981): 78-85. Gibbs, George, ed. Memoirs of the Administrations of Washington and John Adams, Edited from the Papers of Oliver Wolcott, Secretary of the Treasury. New York: W. Van Norden, 1846. Hamilton, Neil Alexander. "Connecticut Order, Mercantilistic Economics: The Life of Oliver Wolcott, Jr." Ph.D. diss., University of Tennessee, Knoxville, 1988. Kerber, Linda K. "Oliver Wolcott: Midnight Judge." Connecticut Historical Society Bulletin 32 (1967): 25-30. Schmauch, Frederick Hugo. "Oliver Wolcott: His Political Role and Thought Between 1789 and 1800." Ph.D. diss., St. John's University, 1969.
ca. 15 ft. (ca. 10,000 items); collection contains correspondence, documents from Wolcott's public service, record booklets containing comptroller of Connecticut and U.S. Treasury records (1784-1806), and other papers; microfilm copy available at Harvard University. 10,000 items; finding aid; correspondence and record booklets containing U.S. Treasury records. 1 container (300 items); family and political correspondence. Wolcott family papers II, 1754-1932. 4 boxes and 1 container; finding aid; personal and professional correspondence. 13 folders; 0.1 linear ft.; 13 letters written by Wolcott as Secretary of the Treasury to David Henley, general agent for the War Department in the Territory of the United States South of the River Ohio, regarding public contracts for military and Indian supplies in what is now Tennessee. 0.15 linear ft.; finding aid; restricted; collection contains assorted papers related to Wolcott's appointment as Secretary of the U.S. Treasury (1760-1833) and family correspondence. 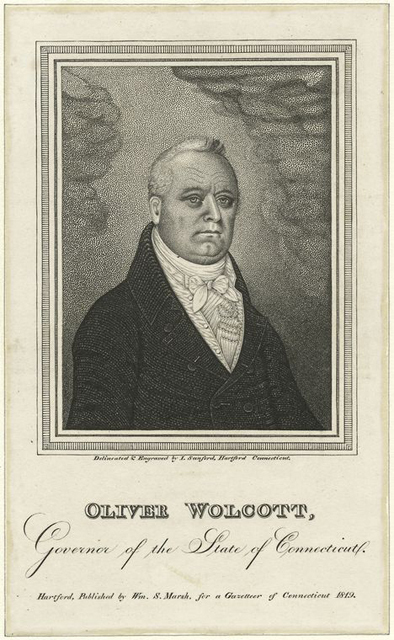 Oliver Wolcott, Governor of the State of Connecticut; I. Sanford; Stipple engraving; 1819; Emmet Collection of Manuscripts Etc. Relating to American History, Print Collection/NYPL Digital Gallery, New York Public Library, N.Y., ref. #: 265494/digital #: 478621. Reference image courtesy of the New York Public Library. Further reproduction prohibited without permission of the library. Oliver Wolcott, Jr.; by Gilbert Stuart; Oil on panel; ca. 1810; Litchfield Historical Society and Museum, Litchfield, Conn., ref. #: 1977-19-1. Oliver Wolcott, Jr.; by George Catlin; Oil on canvas; ca. 1810-1815; Litchfield Historical Society and Museum, Litchfield, Conn., ref. #: 1963-02-3. Oliver Wolcott, Jr. (1760-1833), B.A. 1778, ML.d. 1819; by John Trumbull; Miniature oil on paper; ca. 1790; Yale University Art Gallery, New Haven, Conn., ref. #: 1966.62. Oliver Wolcott, Jr. (1760-1833), B.A. 1778, LL.D. 1819; by Gilbert Stuart, copy after John Vanderlyn; Oil on canvas; ca. 1820; Yale University Art Gallery, New Haven, Conn., ref. #: 1830.2. Oliver Wolcott; by Shobal Vail Clevenger; Plaster bust; ca. 1820-1830; Connecticut Historical Society, Hartford, ref. #: A2019. Oliver Wolcott (1760-1833); artist unknown; Plaster bust; ca. 1830; Yale University Art Gallery, New Haven, Conn., ref. #: 1900.27. Oliver Wolcott; by Samuel Stillman Osgood; Oil on canvas; 1832; Massachusetts Historical Society, Boston, ref. #: MA330425.